At the start of John Oliver’s guest stint hosting The Daily Show, I was skeptical. I’ve been watching The Daily Show nightly (or the next day…or the entire week on Saturday) for about the last three years, the only thing close to a non-sports news program I consume on a regular basis year-round. Coming off another ridiculous election year, I was riding high on the cult of Jon Stewart. And though I appreciate Oliver’s politically charged standup—and that it doesn't rely on Lewis Black’s brand of bombast—I didn’t want anyone to come in and fly too close to the sun, even one of the current correspondents. Not that I expected failure, but I figured holding steady with merely acceptable jokes, and relying on field reporting and correspondent-heavy episodes would be the norm. Oliver started out tentative—and he has just as many minor disappointing fallback tics as Stewart—but over the course of 32 shows, he completely surprised me with how comfortable he could be on the other side of the desk. Stephen Colbert has proven a brilliant persona all his own, perhaps best suited to a jump to late-night hosting when he’s ready to hang up the character—as that Daft Punk high-wire act shared a lot with what Jimmy Fallon does on his show. Steve Carrell broke through with the right movie and the right series at the right time (but still no Dan In Real Life sequel…) that catered to his comedic talents. Ed Helms jumped to Carrell’s lifeboat and then his own film career. Rob Riggle, Rob Corddry, and many other correspondents with more than three years experience—Most recently Wyatt Cenac—moved onto other things. 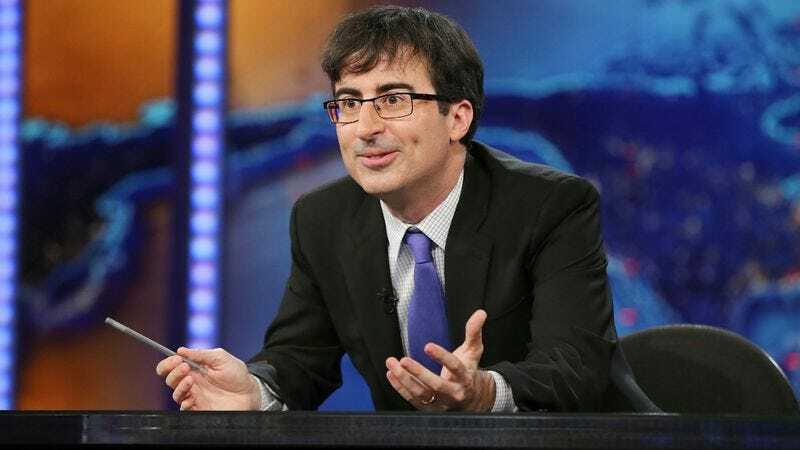 But Oliver came along at the right time as a chiefly political comedian and proved that Comedy Central does not have to worry about finding another host when Jon Stewart decides to call it a day. There is a host waiting in the wings, and his name is John Oliver. If Comedy Central doesn’t go to him first to succeed Stewart, they make the biggest possible mistake in handling The Daily Show’s future. It makes sense that after 31 shows, on the verge of another extended break before Jon Stewart returns from directing his first feature film, that the staff decided to take it easy and make Oliver’s last show a victory lap highlighting the best of the summer stories. The summer is downtime for typical American television, and in a non-election year that goes double. News doesn’t stop, but national stories tend to hit a lull in off-years, which sends The Daily Show scrounging for good topical material or kick to more produced segments in the field. But Oliver lucked out considerably with a cavalcade of crazy stories. The Voting Rights Act, gay marriage, Edward Snowden, Paula Deen, Wendy Davis, an immigration segment with Mick Foley, the royal baby, a mid-show blackout before an interview with Aaron Sorkin all notched highlights for a two-month period. In the case of one Anthony Weiner—singled out as the biggest news boon of the past few months—it was incredibly fortuitous that Oliver and not Stewart sat in the chair. Before Weiner’s well-publicized scandals, Stewart lauded the congressman for his efforts in passing 9/11 first responder health legislation. Weiner’s remarks—and Stewart’s repeated use of that now-less-infamous clip of vociferous argument on the House floor—only added to the personal history the two had as friends. It was always uncomfortable for Stewart to address anything but the comedic low-hanging fruit of the guy’s name and his then-unclear penchant for extramarital affairs that involved no physical contact. Oliver didn’t pull a single punch, and his brutal takedowns of Weiner’s attempts to spin the story somehow in his favor formed the best example of what his version of the show could do to best the guy with his name in the intro. My least favorite aspect of Oliver’s first guest hosting run—there will be certainly more now that the ship didn’t go down immediately—was the constant reminder that Jon Stewart was gone in the least consistent ever-present joke to start each episode. And as the middle segment of a highlight reel for Oliver’s guest stint, they brought back the same gang-up mentality from Oliver’s first show, where all the correspondents rag on how much Oliver’s hosting ineptitude ruined The Daily Show. As Sam Bee elegantly summarizes: “A once-proud American institution brought to its knees by gross mismanagement and incompetent leadership. You wonder if it will ever again be the icon it once was.” The self-deprecation was a nice touch during the first week, but the continued self-flagellation felt worn out by the second week and felt like a bad reminder every time after that. It’s a nice bookend, but contrary to my initial outlook, Oliver did more than just hold the show in neutral for the summer, waiting for the master to return. He showed that while Jon Stewart has a distinct flair and zeal for this material, an experienced standup with years spent on political humor and groomed in the Daily Show style knows how the rhythms work. Stewart’s transition from Craig Kilborn perfected a successful way to make The Daily Show politically relevant to the conversation on current events and important to the comedy world as an incubator of talent. It only makes sense that the eventual third host should come from within the family. And in addition to all the noteworthy lines and events in the first two segments, Oliver also grew as an interviewer. The single most surprising interview he conducted was with former U.S. and current Egypt national soccer team coach Bob Bradley, who can speak to a very unique experience watching the political turmoil in Cairo. His anecdote about giving a stirring halftime speech to his team is my pick for the best interview moment of the past few months, but other highlights include that makeshift situation with Sorkin, Louis C.K., and Tuesday’s guest Josh Oppenheimer, the director of The Act Of Killing. Though not as adept at thoroughly crushing opponents he disagrees with—Rand Paul strangely had the same kind of success that his father Ron did at getting his message out as a guest of Jon Stewart—he showed significant improvement. Jon Stewart’s first film may be a total flop, but it’s a passion project that may find a dedicated audience. And if it’s a success, he may want to explore subsequent projects. If nothing else, John Oliver’s substitute hosting role can provide the network and the Daily Show audience with the assurance that should Stewart take an extended leave again, or reach a point where he feels like leaving, there’s at least one bona fide, production-tested day-to-day host prepared to take over the show. I don’t know how I never noticed this before, but Oliver (and Jessica Williams at one point) can flip off the camera after 10pm without getting censored? A nice touch to have Simon Pegg on as the final guest for this run, though it was probably accidental. After Pegg’s WTF episode this week, this gave him a chance to get incredibly British with Oliver and it was delightful.